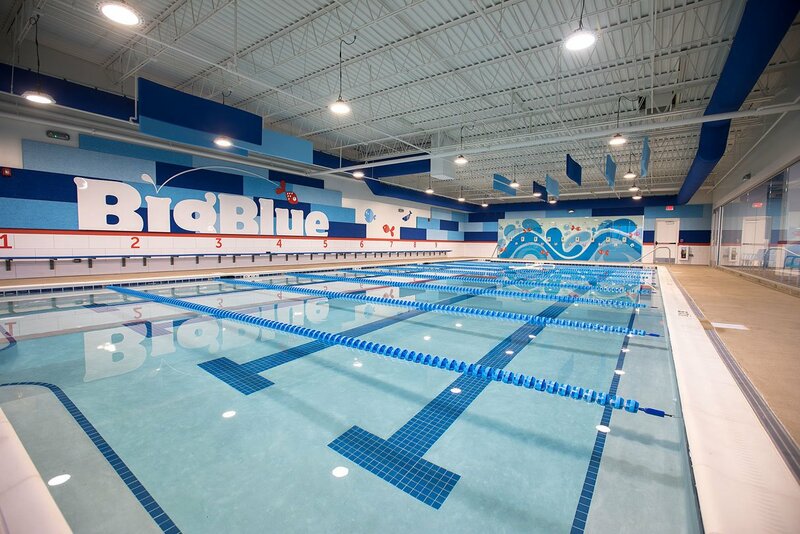 ARCO/Murray recently completed a 9,000 square-foot building conversion from a retail space to a swim school for Big Blue Swim School in Hoffman Estates, Illinois. The build-out included a 3,500 square-foot pool area and multiple interactive children’s play areas for an enhanced customer experience. The 50,000-gallon salt water swimming pool utilizes a defender filtration pump and an automatic chemical controller system with wi-fi capabilities. The system ensures that the water is easier on the children’s skin and allows Big Blue to view real time readings of the pool PH, salt levels and temperature. The pool area includes a custom decaled glass shower wall and ergonomic shower heads for easy use after each lesson. Flooring throughout the facility includes anti-microbial carpet for comfort and cleanliness as well as an epoxy pool deck. The 1,100 square-foot changing area includes a curved wave-wall dressing room design, and the custom millwork reception desk and light fixture package contribute to the uniqueness of the facility.